You�re viewing our Sausage Maker corn syrup solids � 1 lb, 8 oz. TSM's corn syrup solids is used in processing dry-cured and semi-dry-cured sausages. The corn syrup solids helps maintain the cured color of meats longer. Use Use 1-1/2 tbsp. 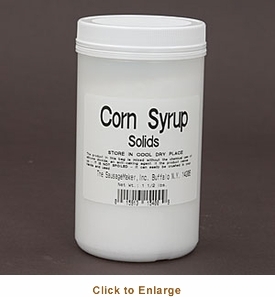 corn syrup solids for every 10 lbs. of meat. 1 lb. 8 oz. package of corn syrup solids will process up to 320 lbs. of meat. If you have questions about our products we are here to help you. Scroll down to view our Sausage Maker soy protein concentrate � 1 lb. 8 oz.